There’s something surreal about the onboards from cars that travel over 220 mph lap after lap around an oval. Indianapolis Motor Speedway looks huge in all other respects, yet the onboards make it almost feel like you’re in your cousin’s Camaro, doin’ donuts on the lawn. Everything feels much, much smaller. 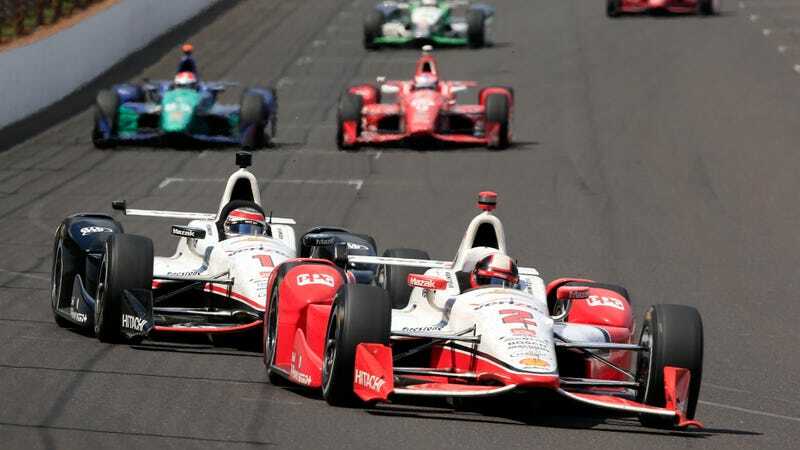 Here are the last few laps of the Indianapolis 500 from aboard Juan Pablo Montoya’s winning car, where it looks like he drives in fast-forward. According to USA Today, his average speed during the race was 161.341 mph, and he won by a mere 0.1046 seconds over his Penske teammate Will Power. There’s no audio on this video besides the in-car radio, where you can hear just how involved spotters are at the Indianapolis 500. There’s more teamwork involved in driving these cars quickly around an oval than you might expect. The spotter helps Montoya see what’s around him, and if a corner is clear to pass through. The downfall of many onboard cameras is that they flatten everything out a bit, but you can still see how quickly these cars reach all four corners of the famous circuit. If you thought Montoya’s moves at the end of the race were crazy on the television view, check out how he cuts in front for the lead from inside his car. Moves get ballsier as the final laps approach. It’s the Indianapolis 500, one of the most famous races in the world. Everyone wants to win this race. If you didn’t see the full ending of this year’s Indianapolis 500, drop what you’re doing and go watch it right now. Sure, the crash cleanup late in the race felt a little like NASCAR’s infamous tendency to end with a green-white-checker trio of laps, but the restart after that crash didn’t disappoint. Update: This post originally said that the lap speeds were at least 150 each lap, but the average takes yellow flag laps into account. It has been swapped.